Lava fountaining regularly from the Philippines’ most active volcano has flowed up to 3 kilometers (1.86 miles) from the crater in a dazzling but increasingly dangerous eruption. Mount Mayon was spewing lava up to 600 meters (2,000 feet) high and its ash plumes stretched up to 5 kilometers (3 miles) above the crater. The Philippine Institute of Volcanology and Seismology said Wednesday morning two of the lava flows had advanced more than a kilometer (.6 miles) and pyroclastic flows — superheated gas and volcanic debris — had reached 5 kilometers (3 miles) from the crater in one area. 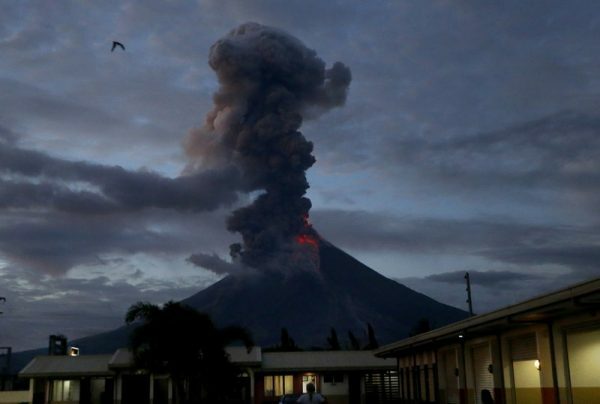 Authorities on Monday had expanded the no-go zone around Mayon to 8 kilometers (5 miles) from the crater, and more than 56,000 people were staying in evacuation centers as of Tuesday afternoon.